We’ve been in practice since 1925 and have treated patients across many generations. We offer care at two convenient locations. 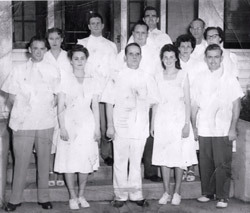 The Bend family has been offering chiropractic care to New Baltimore, Fort Gratiot since 1925. When patients visit us for care they leave with a testimonial about how happy they are with the care they’ve received at Bend Chiropractic. This recognition is gratifying and motivates us to extend our chiropractic care to all those who reach out to us. Are you in pain? Are you looking for overall wellness for you and your family? No matter what your condition or what your age; we are here to help. If you are 3-day-olds, 103-year-olds or anywhere in between, YOU are welcome. We use diverse chiropractic techniques and services to meet the needs of you and the entire family. The care you will receive is tailor-made just for you. Chiropractic holds the key to our patient care. It removes the interferences with the patient’s condition and makes them feel better. In addition we also offer care that compliments chiropractic for your overall health. Massage Therapy: “Massage therapy complements chiropractic care very well.”- Dr. Ron Bend Coupled with chiropractic care, massage therapy helps our patients relax and experience the maximum benefits of their care. Nutritional Advice: We offer nutritional advice to all of our patients if they’re interested. We have a product called Advocare, which is a healthy meal type diet plan to get you back on track to eating better and losing weight. We have products available in our office as well as through online ordering. Exercises: You’ll receive training on some exercises you’ll do at your follow up visits to help strengthen your spine. All of these services are available to you under one roof to help you reach all of your health goals. Give us call today at (586) 725-1111. Let’s get your health on track.